ATC SCM50 review | What Hi-Fi? Our chosen reference speakers need to be a transparent window to the sources and amplification we test, and these ATCs fit the bill superbly. In short, they are honest, even-handed speakers that don’t put a significant twist on the signal they’re fed. Rated at just 85dB/W/m, they aren’t sensitive, nor are they a particularly difficult load, meaning even budget amplifiers can work with them up to decent, though not ear splitting, volume levels. Compare the SCM50s to most rivals and, on paper at least, there seems to be little to shout about. They are large three-way standmounters and built in a pretty traditional manner. There’s nothing here that seems obviously high-tech or particularly innovative, either in the speaker’s design or the materials used in the drive units or cabinet. But that shouldn’t be taken as a negative. The company’s focus is always on good solid engineering and a close look at the SCM50s makes that clear. All three drive units are designed and built in-house. That’s rare, with most rivals simply buying off-the-shelf drivers from one of the big OEM suppliers, such as Scanspeak or SEAS. These are no ordinary drive units. The company’s background is firmly planted in the Pro world where reliability and high power handling are essentials. But these things are not ATC’s only aims. The company’s engineers value low distortion and dynamic ability, and have spent years developing these units, only putting them into production when they are sure that every box has been ticked. When improvements are possible the company usually follows through, and it has carefully evolved the SCM50s through the years. The brand also has firm ideas about using hard cone materials such as aluminium – it doesn’t like them because they ring – so it comes as no surprise to find that the 25mm tweeter and 75mm midrange unit both use well-damped fabric dome diaphragms. A 23cm woofer with a stiff fibre and resin composite cone produces the lows and is tuned by a large, front facing port. Around the back there are three sets of terminals, so it’s possible to tri-wire or even better, tri-amp. Alternatively, ATC has long promoted actively driven speakers, and makes powered variants of most of its products. The active SCM50s cost £13,075, and include a total of three power amplifiers per cabinet that add up to 350W output. Considering the technical advantages of active operation and the price of a stand-alone high-end power amplifier with that much grunt, that option looks pretty tempting. What of the SCM50's enclosure? It’s a 72cm tall solid rectangular wooden box that’s neatly covered in real wood veneer. The standard finishes include black ash, cherry, maple, oak, rosewood and walnut. The size of the speaker means that you’ll need a short stand and the company makes a dedicated frame design for just this job. Any speaker at this level needs a suitably capable system to shine. We use our usual reference Naim NDS/555 PS music streamer and Clearaudio’s Innovation Wood turntable package as sources, with a Cyrus Phono Signature/PSX-R2 phono stage and Gamut D3i/D200i amplifier further down the signal path. We use a mix of upmarket cables from Chord Company and Audioquest. Let’s think about that for a minute. If your system’s electronics or the recording you’re playing have a particular character, the SCM50s will reveal it. If that character happens to be forward or aggressive, that’s how the speaker will sound. Equally, play a great recording on a truly capable set-up and the ATCs will sound fabulous. Either way they only reflect the signal they’re fed. 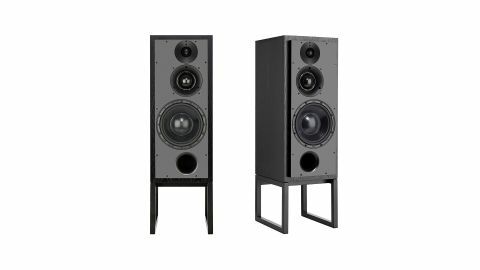 They’re even-handed tonally – just as you would expect from a speaker born from the world of monitoring – and image well, provided you take just a bit of care with positioning. In our test room, the SCM50s sound most at home well away from rear and side walls and slightly angled in towards the listening seat. We prefer the offset tweeters to be on the inside to firm-up focus. Positioned this way, we get a broad and layered sound stage that’s solidly focused and pleasingly stable. Move to the likes of Jay Z’s Blueprint and the ATCs take it all in stride, punching out the album’s hard-charging rhythms with confidence. There’s an impressive amount of attack here as well as the ability to track multiple instrumental strands without getting muddled. These ATCs dig up plenty of information, whether it's a nuance in Jay Z’s rapid-fire delivery or the texture of a bass sound, and render it in a natural and unforced way. These speakers don’t go out of their way to highlight detail. They just present all the information in a balanced, natural and convincing way. Every so often we come across rival speakers – usually of higher cost – that better these ATCs in some respect, whether it’s outright resolution, openness, stereo imaging or rhythmic precision. Yet we haven’t managed to find something that’s as satisfying an all-rounder or as practical to use as a day-to-day review tool. Considering the SCM50 was originally introduced in the mid-80s, that’s quite some achievement. It seems great engineering doesn’t date.